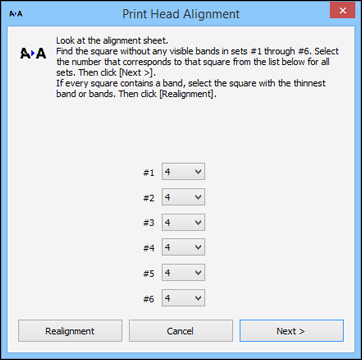 You can align the print head using a utility on your Windows or Mac computer. Windows: Access the WindowsDesktop and right-click the product icon in the Windows taskbar. After choosing each pattern number, click Next. If no patterns are aligned in one or more of the sets, choose the closest one in each set and click Realignment. Then print another alignment sheet and check it. Note: Click Skip (where available) if you want to skip a particular alignment sheet.